Alright, voting time! Is this the cover for the 2011 Furnace Creek 508 race magazine? AdventureCORPS has made a photo of me available for download as desktop wallpaper. It is one of my favorite photos from the 2010 Furnace Creek 508 taken by Marcus Edvalson. He captured me approximately 350 miles into the race, in between Shoshone Time Station #4 at mile 326 and Baker Time Station #5 at mile 382. 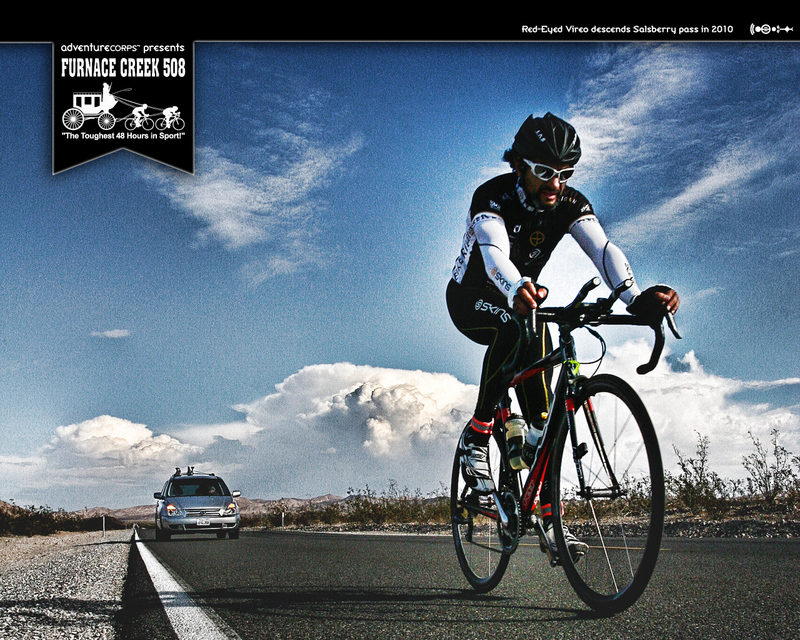 I am secretly hoping that my photo makes the cover of the 2011 Furnace Creek 508 race magazine. If you feel the same, please take the time to post a comment on my blog or Facebook! Felt F2 with Di2 7900 Electronic Dura-Ace, SRM 7900 Dura Ace Wireless Crankset Power with Power Control 7, Skins Compression Pro Cycle Bib Tights and base layer, Bont A1 cycling shoes, Nathan Sports Reflective Gear, Zipp Zedtech 2 wheels, Swiftwick Socks, Bike Religion Cycling Team and Oakley Sunglasses. Looking Great George!!! Awesome picture! Thank you Tracy! Make sure you tell your friends and have them post to my Facebook to get the voting numbers up. I want the race director to see the positive response and consequently use the photo for the cover! Great picture and great socks George! The best racers wear Swiftwick! Thank you for reading my blog and thank you for the BEST socks on the market!!! Thums up! This photo captures adventure, strength, balance and so much of the dynamics of nature-road-rider interplay. Congratulations to the photographer and the rider who are blessed to have shared this experience. Vote for the cover of magazine may be just the beginning of a shot like that. Looking into other multi media publications would not be a bad idea. Thank you for reading my blog. Thank you for your comments! One of my favorites. And definitely worthy of a nod for the cover-shot. I’d say you’ve earned it.